This morning we attended a super cute story time at The Teacher's Lounge Bookstore in South St. Louis County. (Near the Target at 55 and Lindbergh for you locals). My friend Dana introduced us to this story time about a month ago. It meets every Monday morning from 10:30-11:00. It is for ages 2-6 and reservations are recommended... but you can RSVP online. This is the best story time we've attended so far. They have color sheets, songs, a story or two. Then they do a craft and sometimes an activity. The lady who leads is very perceptive of how well the kiddos are staying engaged. She really paces the story time to their needs. The themes are always really cute. Today the theme was "Sail into Summer." We started with a sailboat coloring sheet. Once all the kids had arrived, they read The Puddle by David McPhail . This was great for the theme but it is also a great book for spring. The Puddle is the story of a little boy who goes out to play with his sailboat on a rainy day. In the puddle, his sailboat encounters many imaginary animals. Some are helpful, others are not. His mother has told him to stay out of the puddle.He is able to rescue his sailboat, though, when the sun comes out and the puddle dries up. 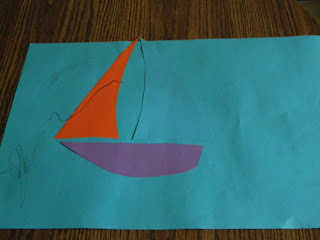 After reading the story, we made a sailboat out of precut shapes. The kids were then encouraged to draw any animals they wanted in their puddle with their sailboat. Drawing animals was actually too challenging for Logan and he wasn't really interested in that. I think, though, that we will add animal stickers to our picture later, if he takes an interest. After the story today, we got a special treat. 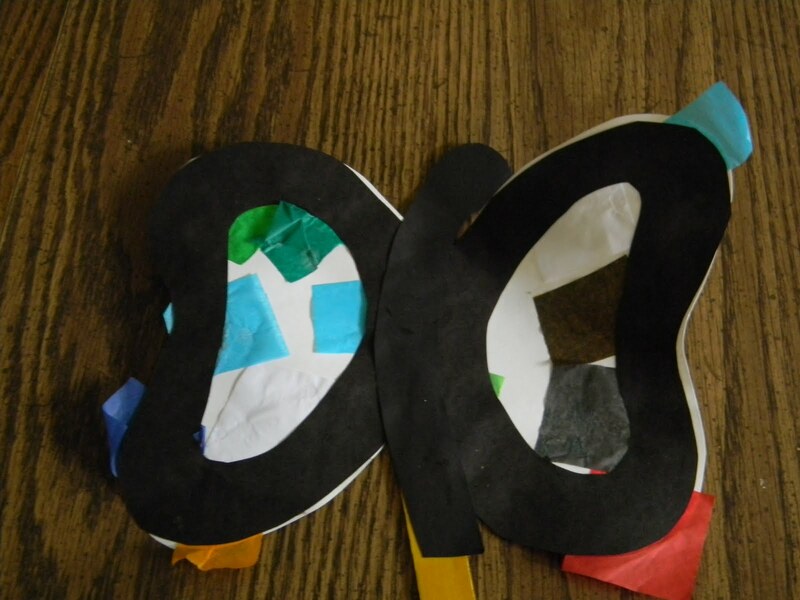 Several weeks ago at story time, the kids made these butterflies. The store set up a butterfly house with some caterpillars. Well, the caterpillars turned to butterflies this week. Today was the day for releasing the butterflies! The kids had a lot of fun watching them fly off into the sunny blue skies. After we left storytime, a thunderstorm rolled in. Which means, after nap time, there should be some perfect puddles for sailing toy boats. Sounds like a lovely book. 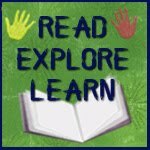 I would love it if you link up to Book Sharing Monday on my blog. 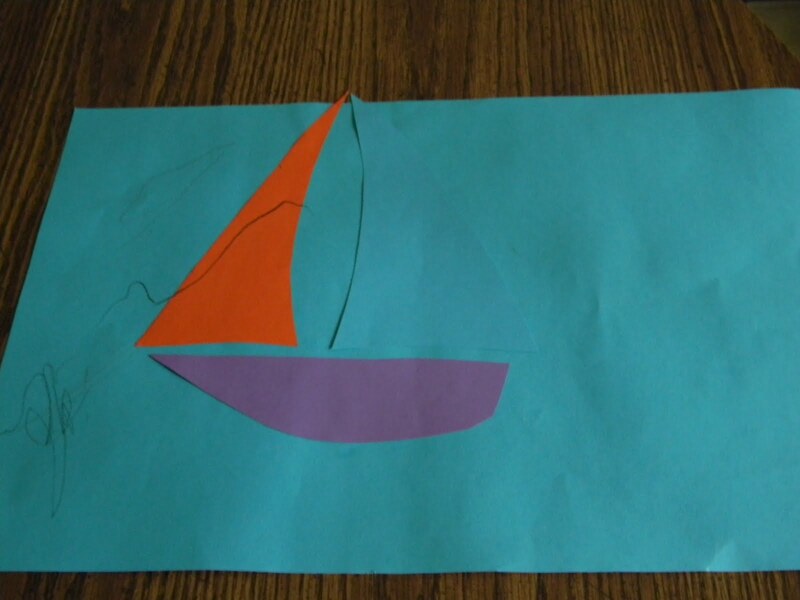 Love the sailboat...sounds like a really cute program and book for kids. Your story time sounds great! We read this book some time ago and enjoyed it as well. Thanks for joining WMCIR! Love it. I've always enjoyed creating related activities to go with the stories I read to my preschoolers- it creates such huge excitement when we read a story about a monster, say, and then go to the art area to design our own monster! Great ideas here. We've been having lots of storms too! What a beautiful butterfly! Great way to tie in an art activity with a book! 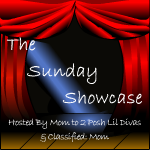 Thanks for sharing it at The Sunday Showcase. I love this book! 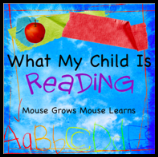 We did some fun activities with our little Mommy and Me Book Club with The Puddle, too!